Baltimore ‘Mom Of The Year’ Arrested For Child Abuse After Another Enraged Smack Down. In the midst of the Baltimore riots, one mother claims she did what she had to do! 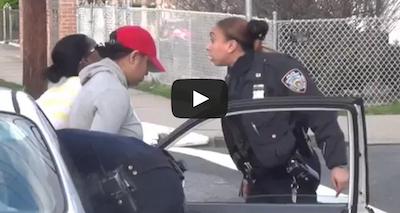 The angry mom catches her son protesting violently, and smacks him around. However, after demands from civil rights activists, this “Mom of the Year” is now being labeled a child abuser. On Wednesday evening, fueled by rage, this Baltimore mom allegedly gave her son another beat down. The sound of screaming and pounding were so loud, it prompted neighbors to call the police. Before police could get there, the ‘Smack Down Mom’, as she’s referred to now, fled the scene with her friend. Just minutes later, police apprehended her and it was all caught on video!